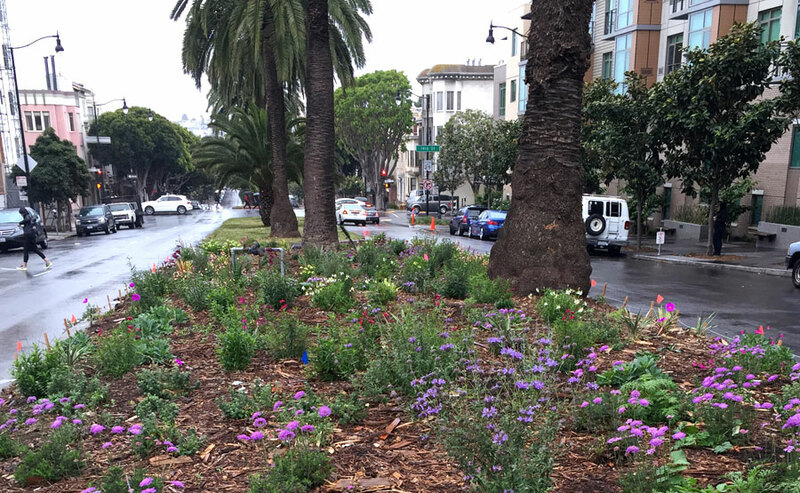 BASE worked with the community and stakeholders to create a beautiful, drought tolerant pollinator garden in the first block of Dolores at Market Street. Widespread, careless use of pesticides in both urban and agricultural habitats have created an environment less hospitable to pollinators. We committed to combat these harsh conditions with carefully selected low water, pesticide-free, pollinator friendly plants that will bloom in an unbroken relay all year long. Vivid California Poppies, Sages, spiky Spider Aloe, and other bright, drought tolerant, and pollinator friendly plants can create a much needed habitat for our bees and pollinators.